It was August 23rd, 2001, when I first visited a Japanese castle. It was like nothing I'd ever seen. But, I very much liked what I saw. In the 18 years since then, I have travelled to all but the northern regions of Japan to explore these fascinating, historical sites. 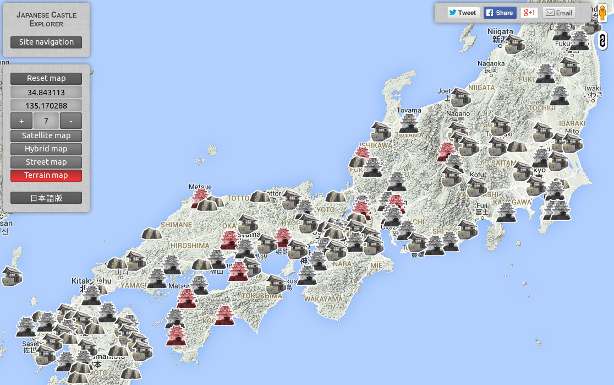 This website is a record of my visits and of my passion for Japan's castles. Interactive Map - Clicky Fun! Whether you are looking for castles in a particular region, or hoping to find something new, this handy interactive map is a fun way to explore Japan's castles. And, you guessed it, this is where the site got its name. 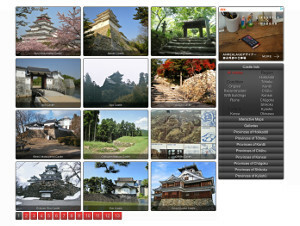 150 castles can be found on the map, from Okinawa in the Southwest to Hokkaido in the very North. The best examples tend to be found in Central and West Japan. All 150 castles can be found in this alphabetized list. The castles have also been categorised by their current state or condition (as explained above), or by their location (as explained in the region section below). Click the button below to start exploring. Hokkaidō - Very few castles can be found in Japan's Northern-most island. There is the very impressive Bastion-style castle of Goryōkaku Fort though. Tōhoku - sizeable Northern tip of Japan's main island. Interestingly, castles in this region were constructed of earhten defenses instead of stone. Kantō - Though many castles once existed in the area surrounding Tōkyo none were as impressive as the Imperial houshold. It's been known by many names but I call it Edo Castle. Chūbu - Central Japan is a region flush with the former strongholds of Japan's most famous Samurai. That aside, there is the Matsumoto Castle which is real pretty. Kansai - The region surrounding Ōsaka & Kyōto has countless fascinating and unique castles. 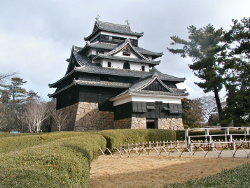 Ōsaka Castle with its powerful stonework is of special note. Chūgoku - There remain many impressive castles in the Western tip of Japan's main island. Many were built to keep enemies of the Tokugawa Shōgunate in check. Shikoku - The highest concentration of castles to have retained an Edo Period (1603 - 1868) central tower can be found in the island of Shikoku. Kyūshū - My home turf! I for one, really enjoy the castles of the island of Kyūshū. The highlight of which would undoubtedly be Kumamoto Castle. Okinawa - The castles of the islands of the Okinawan archipelago are known in the local dialect as Gusuku. Castles in other areas of Japan are generally refered to as Jō. Korea - Yes, Japanese Castles in Korea. These were established during Toyotomi Hideyoshi's ambitious quest to conquer China.